Summer has extended its long wings, taken flight and is circling above us. As we all hurry inside for safety, afternoons and evenings in with friends multiply. It’s passed lunch time and it’s not quite evening time, you’ve just put a on movie and she's filling you in on her trip to Paris, something small to eat and accompany is a must. During my stay in NYC, we photographed a series of vegan recipes using baking sheets (both practical and beautiful) as serving dishes. Inspired by the vegan baking sheet photography, I’ve adapted this warm, roasted, sweet and salty snack recipe. 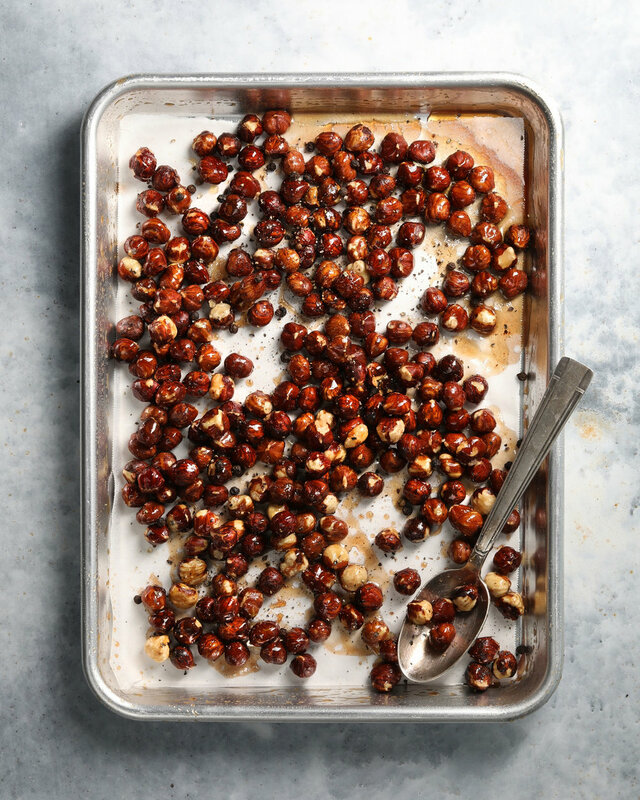 Slowly roasted nuts are coated with the best maple syrup and sprinkled with Szechuan pepper for a quick wake up call. I know everyone will enjoy its aromas caramelizing in the oven and textures crunching in their mouths.